If you'd like to explore Karnataka’s architectural treasures in less-chartered territory, set aside a few more days to discover the splendid remains of Bidar. Bidar, once the capital of the Barid Shahi dynasty, still has the air – and appearance – of a medieval city. History weighs heavily on Bidar. The place which was once the first capital of Rashtrakuta dynasty is today located in Bidar district. Kalyani, the capital of Western Chalukyas, is today known as Basavakalyan is in Bidar district. Kalyani later became the capital of the Kalachuris. 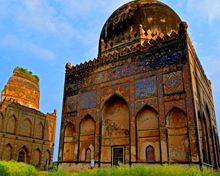 Bidar passed into the hands of the Delhi Sultanate and later into those of the Bahamani rulers. After the disintegration of the Bahmani sultanate into five independent states, Bidar became an independent kingdom known as Barid Shahi. 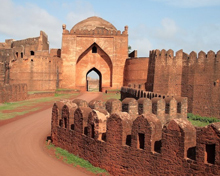 Bidar was earlier capital of the Bahmani kingdom. The founder of the Barid Shahi dynasty was Qasim Barid. As prime minister of the Bahmani sultanate, he was the de facto ruler of the kingdom. He died in 1504 and was succeeded by his son, Air Ali Barid. The Bahmani monarchy had become so powerless that Air Ali Barid was able to act as king-maker on the demise of succeeding do-nothing king. With the flight from Bidar of the last Bahmani ruler Kalimullah in 1528, there was no impediment left for the assumption of kingship by the minister. But Bidar was always in a precarious condition, being hemmed in by powerful rulers who were always knocking at the gates of the capital. Amir Al Barid died in 1542, and was succeeded by his son Ali Barid Shah. He was an artist and a man of letters, and he distinguished himself by commanding the left wing of the allied armies which shattered the Vijaynagar forces in the battle of Talikota in January 1565. But this did not help the security of the kingdom and it was often menaced by the army of Ahmadnagar Ali Barid Shah died in 1579. His mausoleum at Bidar is one of the most magnificent monuments in Bidar today. He was succeeded by his son Ibrahims. After Ibrahim came a number of weak rulers. Not log after, Ibrahim Adil Shah II invaded Bidar and annexed the kingdom to Bijapur in 1619. This historical fort was a citadel of the Muslim rulers of the Bahamani kingdom in the 14th and 15th centuries. Built by Ahmad Shah Bahmani between 1426 and 1432 A.D, the fort is surrounded by three miles of walls with 37 bastions. It was annexed to the Mughal Empire by Aurangzeb. Within the enclosures of the fort you will find royal palaces characterized by elaborately carved wooden pillars. 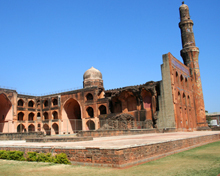 The oldest Muslim moumnet in Bidar, the Solah Kamba Masjid is one of the largest in India. Here you will find tombs of the rulers of the Bahmani kingdom which later disintegrated into five Muslim Sultanates of the Deccan. Beautiful paintings adorn the interiors of the mausoleums. The three storied Madrasa of Mahamud Gawan is one of the chief attractions in Bidar. With its massive walls and grand minarets, this college is architecturally similar to Madrasa at Fez and was once a famous center of learning, attracting scholars from all over the Muslim world. It was built by Mahamud Gawan who was an erudite scholar and a powerful administrator during the Bahmani rule. 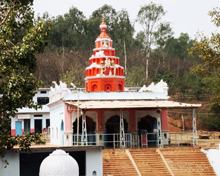 Pap Nash Temple is another cultural highlight of Bidar and known for the site visited by Lord Ram while he was on his way to Ayodhya after his victory over Ravana. 136 km from Bidar, Hyderabad is the nearest airport which is connected by flights to major cities like Kolkata, Delhi and Mumbai in India. Bidar is also connected by rail with different places in India. Good roads connect Bidar with different places in India.